Massage therapy and Chiropractic care complement each other well. Chiropractic treatment focuses on improving the framework of the body (bony skeleton). Massage therapy in turn helps to reset muscular tension patterns. She is so caring and professional. We couldn’t function without Ingrid’s healing hands. She is so caring and professional. From day one the improvement was amazing. Judi is so friendly and helpful it is always a pleasure to see her. It’s like being part of the family, genuine care and compassion. We would highly recommend CT and Ingrid. Thank you for all you have done for our whole family. I am walking tall now. Highly recommend CT an extremely good Chiropractor! I am walking tall now. CT massive thanks. Their knowledge and experience is a real godsend. I have been treated regularly by CT and Ingrid. I have found the treatment invaluable. Their knowledge and experience is a real godsend. I have seen both Ingrid and CT and have found them to be excellent Chiropractors. After a couple of visits my hip started to improve. I would highly recommend them, very professional and friendly. I highly recommend Blackfen for anyone needing chiropractic care. I feel completely at ease with the professionalism and confidence that the whole team have. I am so grateful to C.T. for the progress made with my back. THE BEST!! What can I say apart from “Wow”! The staff are so friendly and helpful. Ingrid is so good at her job. Thank you Blackfen Chiropractic Clinic for helping to improve our lives. I can move my neck without pain! Jenny! You have healing hands. I can move my neck without pain! Thank you so much. 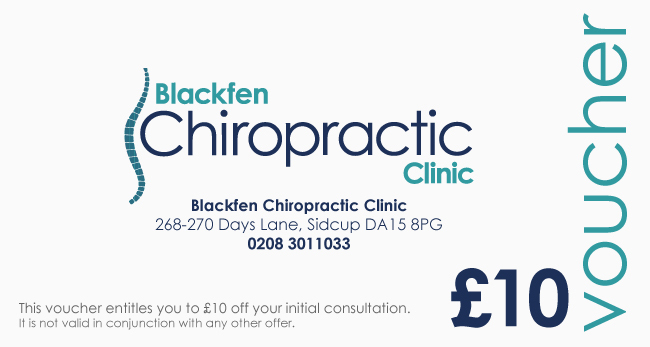 I would highly recommend Blackfen Chiropractic Clinic. The therapy is great for body and mind. I will keep coming whether I need to or not. The therapy is great for body and mind. CT is very knowledgeable and a great bloke. C.T. & his staff are brilliant & provide a fantastic first class service. This morning for example I couldn't move my neck, emailed the clinic at 8am followed by a call from CT, and I was booked in for 9.30am. I saw Jen and she did a great job and explained what was causing the problem. Very highly recommended !! Don't leave those aches / pains like I used to do!! © Blackfen Chiropractic Clinic, 2019. All rights reserved.